The first thing that hit me when we arrived was the view. This place has thee most spectacular setting with gorgeous views. The family who own this place have gone to great efforts to make it special. We loved all the little details, like the welcome pack, the art everywhere, how much they welcomed our dog and the amazing BBQ hut. We would definitely come back. This was our second visit but with a twenty year gap in between ! It was fabulous and we had so much fun. There’s lots to do locally so we didn’t mind the rain. The private beach on the Loch was amazing and we took a boat, canoes and a wonderful inflatable swan and had hours of fun and a barbecue. It was a fantastic holiday and we will add these experiences to the wonderful memories of our first visit. Thank you Deniel for being so helpful. Can’t fault in any way! Even the weather behaved!!!! The Lodges are perfect, equipt with everything even down to a slow cooker! Balcony felt very private and we made the most of everything. We swam in the loch, BBQ’d on the beach and enjoyed the acres of land that the lodges are set in. Saw deer’s and lots of wildlife. We climbed Ben Nevis and the lodge was ideal location for our starting point. So many things to explore in the area and can’t wait to come back. Deneil and her family couldn’t be more helpful to ensure we had a good time. Thanks ! We were lucky enough to find a slot from Monday through Friday which suited our timetable perfectly, from the initial enquiry through to the check-out Deneil was professional yet friendly & very informative. John, Sue & Ian were also vert warm, friendly & exceptionally helpful. The lodges, grounds & location are stunning and very peaceful, we needed to relax & unwind and Invergloy Lodges provided the perfect spot for this. 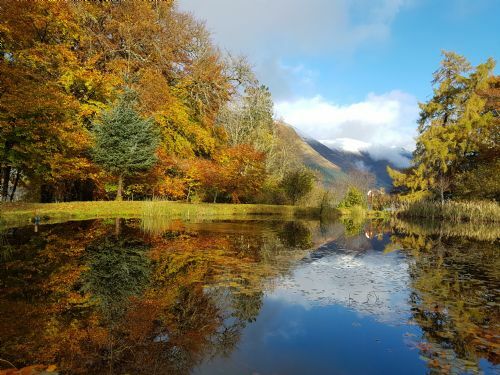 We also found the location for touring the area to be ideal with easy access to Fort William, Spean Bridge, Glenfinnan, Glencoe, Inverness and the surrounds. We can not recommend the team & lodges enough and would return without hesitation. Thank you all for a wonderful break. Again we had a relaxing week in the surrounding we like most with the best personal service you could ask for. Had a most enjoyable stay in beautiful surroundings - Deneil was extremely helpful and made us very welcome indeed. Just had our 5th visit and already planning our next! A superb place to spend some time. From the friendly welcome and superb lodges to the fantastic gardens it's just such a nice place to be. We had a marvellous three days in Arkaig Lodge, arriving in Fort William by sleeper and being able to go straight into the Lodge. The Lodge was terrific with everything we needed there. I don't think we wanted for anything and Deneil couldn't have been more helpful. In particular the beds were super comfortable providing the most restful night's sleep I have had away from home for a long time. Although there was not much snow around the mild weather brought out the peace and tranquility of Invergloy, a much needed respite after London. We'll be looking for a longer stay next time. We had a fantastic stay at Arkaig Lodge. We were 2 adults, 3 children and our black lab. The Lodge is equipped with everything you need. Grounds are beautiful. Staff are wonderful. Lovely beach area and stunning views. 20 minute drive from Fort William. Recommend a visit to the Nevis Range which has various activities for the children and adults. Would recommend Invergloy Riverside Lodges and hope to visit again. We had a fantastic few days at the lodge with kids and dog, location is stunning and lodge was amazing! Definitely go again, thoroughly recommend it . Again we spent a perfect holiday in Arkaig Lodge. The equipment inside and outside is excellent, the nature and wildlife around is as we have never seen before in the area we live in, but the best of all is Deneil and the King family. Whatever you desire, they care for it. All those points let us come again and again and again . . .
Lovely break in lovely surroundings! We all had a brill time here away from usual stresses of work/school etc. The lodge was amazing and had everything you could possibly need. We especially enjoyed the games cupboard, with no wifi this kept boys (14,10,6) busy! Along with swimming and fishing in the Loch. The photos really do not do Invergloy Riverside Lodges justice, it is a beautiful place. Deneil and all at Riverside were friendly and helpful, always on hand if you needed them. Lots to do in localish area. We booked this as we had been talking for a while about visiting the Scottish Highlands..to really get away from it all. This location simply couldn't have been better. The cabin was fantastic, the location beyond beautiful and the facilities excellent. It was the perfect base for visiting Loch Ness, Fort William and Ben Nevis. The lake was fantastic and the kids (13, 11, 8) loved splashing around in it. Our 8 year old daughter was mesmerised by the light up fairy garden which we visited with our torches every night. (With the midges flitting around in the torchlight she was absolutely convinced she could see fairies - it was really quite magical.) And even though there was no wifi or much phone service in the cabins (a feature which appealed to us) there was excellent wifi available at reception so our 13 year old didn't lose his mind completely while 'off the grid'. I cannot recommend this venue highly enough. It was very nice. I loved the corner of the beach, the lake, the sculptures in the woods, the decoration in the accommodation ... a beautiful place that deserves more time. Warm and friendly! Thanks for a wonderful time we could spend there! Beautiful place to be! We really want to thank you for this amazing an unbelieveable time we had at Arkaig Lodge! The location has exceeded our expectations! 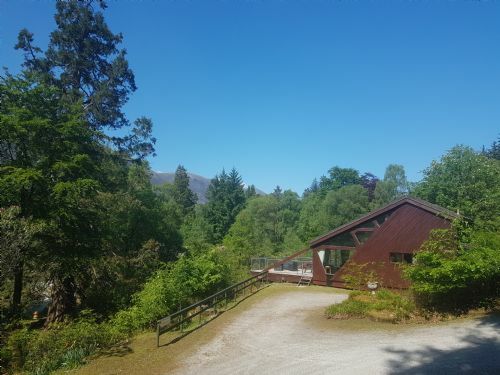 It is in the middle of nature but you also have the comfort of sitting on the terrace, watching the birds and having a great view on the mountains an the loch! We enjoyed it a lot and definitely will come back! A perfect place of you like nature and solitude and just ned to relativt. Beautiful logde, carefully decorated. The surroundings SAS stunning. Very friendly staff. Can absolutely be recomeded. 3 lodges near the lake with all comfort you need. Lovely garden and perfectly situated. The personal 'touch' with fresh flowers on the table when we arrived (never found that before anywhere), it made us feel at home. Everything you can think of in the house, kitchen etc. is there. Watch and listen to the birds. Lovely place to come back one day! 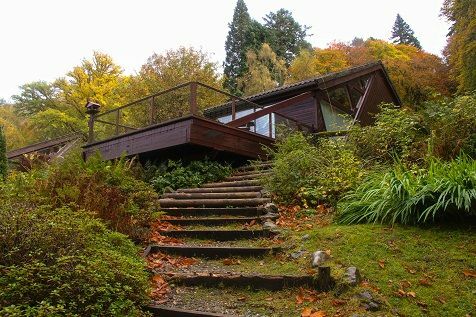 A fantastic location (private Loch access, waterfall in the garden, barbecue hut etc.) paired with very friendly and helpful hosts. Don't miss the food hampers (especially the barbecue one) and the experience in the barbecue hut! Our first stay in Scotland and we really enjoyed it (the kids loved the gardens and the playground)! We spent 1 week end of May at the Arkaig Lodge (four adults). We had a splendid week. The house is spacious enough for all to relax and read a book at the fireplace or outside on the terrace. It gave me such a thrill to watch the numerous of birds that came to the lodge to eat. It takes just a minute stroll to the magnificent loch. We went fishing there and reading and in between just admired the breathtaking view. 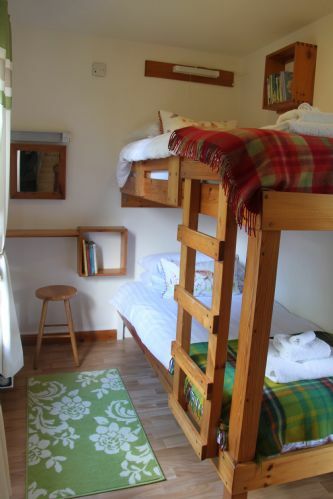 The lodges are just a couple of minutes car drive from Spean Bridge where you can buy some groceries at the local Spar and drink coffee and buy souvenirs at the Woollen Mill. We had a wonderful stay at Invergloy and definitely worth a second visit!! A fantastic stay in a beautiful lodge in a stunning area. The lodge was luxury and the owners of the site were very friendly and helpful. I would recommend this place to anyone! Excellent well kitted out lodge sitting in excellent private grounds in an excellent setting. Great to wake up to find Deer outside your window. Right on the shore of the Loch and close to Fort William. Only down side was the TV reception but who needs the TV in that glorious part of Scotland. Loved it. It was one of the best weeks we ever had in Scotland in about 30 years of visiting this beautiful country. Everything was working perfect. Nothing to complain about. We are looking forward to our next booking. Majestic log cabin enhanced by the outstanding access to the loch, making this a truly unique and memorable holiday location. Our dog loved the loch and long walks every day. 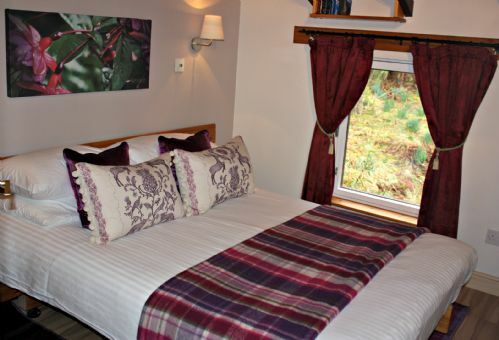 Tranquil surroundings with extensive wildlife in the grounds, within easy reach of Fort William and the Nevis Range. The family are the perfect hosts and can't do enough for you. We are returning guests and haven't seen anything else that comes close to Invergloy. We had a fabulous 5th visit to Invergloy for a week over new year. Deneil and the family took great care of us, going over and beyond the call of duty a number of times. The changes to the lodges were well received, we loved the log burner! The BBQ hut was simply magical and a great way to spend our last night. We have already booked for next year! Amazing stay at the Highlands! Me and my friends had an amazing time visiting the Highlands and Invergloy Lodges where the perfect choice. The lodge was beautiful, warm and it had everything we needed. It is situated in a very convenient location since it is near Fort William and Ben Nevis, and maybe 1 hour drive from Loch Ness. We will definitely visit again in the near future and i highly recommend it! Fantastic ! This is our 4th visit and definitely not our last. It is a 7hr journey for us and worth every minute. Location is superb and accommodation great. Deneil and the rest of the King family are great hosts and are always friendly and approachable and willing to offer you advice on things to do in the area. The information provided in the lodges is great and the new "book" detailing some of the history of Invergloy is brilliant. There are only three lodges loacated here meaning it isn't over "commercialised " and the walks around the gardens and down to the private beach on the loch is breathtaking. Planning our next visit already ! This was the most relaxing holiday ever in a beautiful surrounding, lovely weather and great support from Deneil and her family in every way. The Lodge had enough space, even for friends visiting us. A destination you should always mention. An extremely beautiful setting in a great location. It was a bit expensive for a couple of nights but good value for a weeks stay. Well equipped and we would stay here again. 3 adults and 4 dogs had a wonderful break at Invergloy. We only had 1 sunny day the rest very wet - but we still had a nice relaxing time there. Plenty to see and do within a short drive. The grounds are stunning and nice to chill out and enjoy and not drive at least one day. Perfect for a dog friendly break - and children if supervised as lots of deep water around. We visited Fort William (JJs cafe was great) & the Silver sands of Morar. The cabin is well equipped and just like a home from home. The decking is super slippy and 1 of us fell when wet - so a rubber mat we feel is needed at the back door. Midges bit a few times but not overly pesky. Deneil was very helpful when we needed advise. We would love to visit again 1 day in the future. Disappointed that we had to strip the beds and put the vacuum round and had to pay for the electric rather than being on the price in the first place. We all thoroughly enjoyed our holiday at Invergloy with fabulous weather and scenery. We would definitely go again . It had all the amenities that you need and was very comfortable with a great balcony to look at the view ! We return year after year. The location is perfect for day trips out to explore the highlands but if you just want to stay put and relax the loch side estate is a perfect place to while away time. The grounds are absolutely lovely, the accommodation is high quality and the owners do everything they can to offer you a perfect peaceful location. A beautiful location overlooking the Loch in amazing grounds. The lodge is located in an amazing location, overlooking the loch and mountains. You also have access to your own beach, gorge and the BBQ by the loch. We had a great time in Invergloy, not really stopping all week! We climbed Ben Nevis, went on the Jacobite Train, multiple bike rides, cruised on Loch Ness and also visited Steall Falls - a great week with amazing weather. Many thanks to Deneil and team for making us feel so welcome - hope to return soon! Great holiday with the dogs! After two visits, Invergloy has become one of our favourite places to go on holiday with our dogs. 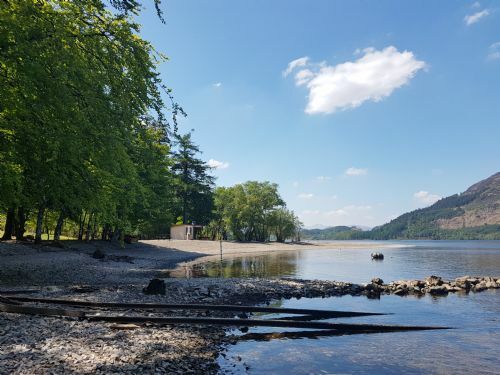 We love the lodges and the surrounding area as it is perfect for a peaceful break and in a great location for travelling around the Highlands. We will definitely return in the future. This is a beautiful place to stay close by to many local amenities and places of interest. 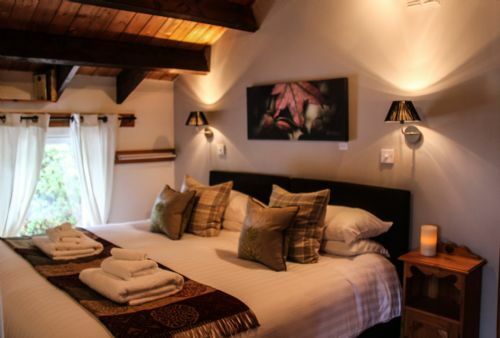 The owners are lovely and very welcoming and the accommodation is very comfortable and cosy. Defiantly worth a visit. Un merveilleux séjour dans une région magnifique et un accueil adorable ! Tout était parfait. La maison, la décoration, la literie, le parc, la terrasse, la vue, le lac, les petits cadeaux d'accueil,un endroit de rêve. Merci ! A wonderful break at a beautiful place where you are well looked after. We have just finished another amazing holiday here and as always have a wonderful stay. We are welcomed into a warm, spotlessly clean and very cosy lodge. Even our little dog has a welcome pack with a biscuit he is always very excited about. It is the little touches that make a stay at Invergloy a step above other places we have booked. Nothing is too much trouble and the lodge is like a home away from home equipped with anyhing you could need for your stay. The grounds are brilliant and we love to sit in the beach hut looking up the Loch and admiring the mountain scenery. Thank you to Deneil and the rest of the family for making our holidays here so special. Another marvellous stay at Invergloy. To sit in the Lodge and look out at the surroundings is food for the soul!! We have a particular association with the area, and it is great that every family member wants to keep returning. 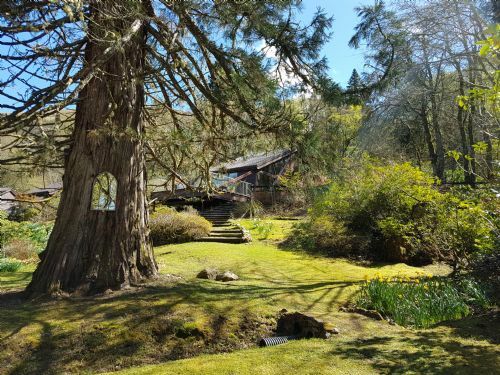 The scenery and location have always been amazing; the lodges and gardens have always benefitted from having had great owners who have loved and cared for them. The current owners, however, have refurbished the interiors to a very high standard, and installed fantastic wood-burning stoves and many other touches. The addition of the 'bothy' at the lochside is also a great idea. The owners, themselves, are very welcoming and pleasant. Looking forward to our next visit. Anyone looking for 'a bit of paradise' should look no further. We had a great time at riverside, the views were amazing. I wish it had been a bit warmer so we could have used the beachside barbecue. The only downside was the expensive but beautiful crockery - it put me off letting the kids wash the pots! The scenery was absolutely breathtaking, set it a quiet remote location, it was a great escape from my everyday London life. The lodge had all you required and kept myself, partner and 3 children entertained. However not having wifi and for most of us a mobile phone signal was a little issue. Having said that would definitely return, probably best in summer when full use could be made of the beach shack and bbq. A very pleasant stay!! A fantastic place to stay, can't praise it enough. Would highly recommend to everyone, will definitely be going here again. Beautiful area, lovely accommodation & folk, made to feel really welcome. 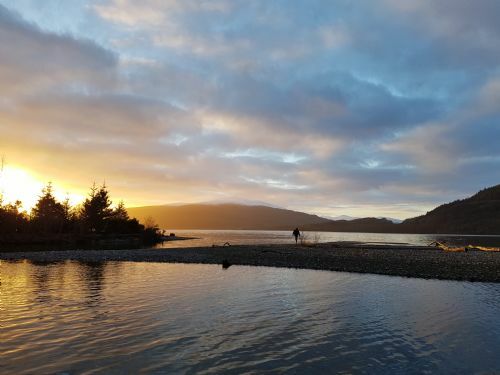 We were looking for a quiet retreat near Fort William to allow us to do some walking, photography and to visit an area we hadn't previously explored. We picked Invergloy lodges as the online site seemed to promise what we were looking for and the lodge we chose offered a massive bed (it turned out to be huge and supremely comfortable.....). We found the lodge very clean and tastefully furnished. There were fresh flowers on the table, tea/coffee/sugar provided and a lovely welcome pack of a gorgeous red wine, cheese, pate and hunky oatcakes - delicious. The setting and grounds were wonderful. There were stunning lochside views and loads of wildlife including voles and rutting deer.......a bonus is the provision of a lochside cabin which can be used by any of the guests to enjoy the lochside views should the weather be cold or inclement...The opportunity for photography on the site and locally was excellent and if you like to take nightime/nightscape photography the location is supurb as there is practically no light polution and views of the milky way and aurorae are stunning. The owners were really friendly and nothing was too much trouble for them. The only point to note is that electricity usage is not included and this wasn't clear on the web site we had visited but it only camt to £17 for 2 weeks in Sept/Oct but we did make full use of the fantastic log burner on an evening! Would we recommend Invergloy lodges - oh yes. Would we go again - definitely! So many wonderful surprises: deliciously fresh air, gorgeous water in a crystal clear lake, and comfort like at home at the lodge. The crackling wood fire makes it very cosy and the garden is so enjoyable - this was as real treat for us and something way beyond what we can experience in the Czech Republic - thank you!